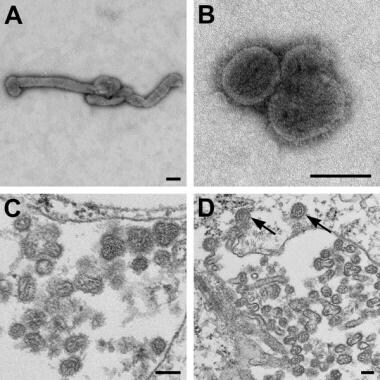 Electron microscopic images of novel Thogotovirus isolate. Filamentous (A) and spherical (B) virus particles with distinct surface projection are visible in culture supernatant that was fixed in 2.5% paraformaldehyde. Thin-section specimens (C and D), fixed in 2.5% glutaraldehyde, show numerous extracellular virions with slices through strands of viral nucleocapsids. Arrows indicate virus particles that have been endocytosed. Scale bars indicate 100 nm. Courtesy of the CDC. Kosoy OI, Lambert AJ, Hawkinson DJ, Pastula DM, Goldsmith CS, Hunt DC, et al. Novel thogotovirus associated with febrile illness and death, United States, 2014. Emerg Infect Dis. 2015 May. 21 (5):760-4. [Medline]. Briese T, Chowdhary R, Travassos da Rosa A, Hutchison SK, Popov V, Street C, et al. Upolu virus and Aransas Bay virus, two presumptive bunyaviruses, are novel members of the family Orthomyxoviridae. J Virol. 2014 May. 88 (10):5298-309. [Medline]. Swiss Institute of Bioinformatics. Thogotovirus. ViralZone. Available at http://viralzone.expasy.org/all_by_species/79.html. Li G, Wang N, Guzman H, Sbrana E, Yoshikawa T, Tseng CT, et al. Dhori virus (Orthomyxoviridae: Thogotovirus) infection of mice produces a disease and cytokine response pattern similar to that of highly virulent influenza A (H5N1) virus infection in humans. Am J Trop Med Hyg. 2008 Apr. 78 (4):675-80. [Medline]. Index of Viruses - Orthomyxoviridae. Buchen-Osmond C, ed. ICTVdB - The Universal Virus Database. New York, USA: Columbia University; 2006. Version 4: [Full Text]. Earl J. Woman dies after contracting rare tick-borne virus. MSN News. July 13, 2017. Available at http://www.msn.com/en-us/news/us/woman-dies-after-contracting-rare-tick-borne-virus/ar-BBEj6lj. Butenko AM, Leshchinskaia EV, Semashko IV, Donets MA, Mart'ianova LI. [Dhori virus--a causative agent of human disease. 5 cases of laboratory infection]. Vopr Virusol. 1987 Nov-Dec. 32 (6):724-9. [Medline]. Kansas Department of Health and Environment. KDHE and CDC Investigate New Virus. December 22, 2014. Available at http://www.kdheks.gov/news/web_archives/2014/12222014.htm. Centers for Disease Control and Prevention. Bourbon virus. Centers for Disease Control and Prevention, Division of Vector-Borne Diseases (DVBD). Available at http://www.cdc.gov/ncezid/dvbd/bourbon/. Accessed: June 8, 2015. Pringle CR. Virus Taxonomy 1996 - A Bulletin from the Xth International Congress of Virology in Jerusalem, International Committee on Taxonomy of Viruses. Available at http://www.ictvonline.org/proposals/Ratification_1996.pdf.